IDT is the world’s No. 1 provider of silicon timing devices (clock ICs) and offers the industry’s broadest product portfolio for networking and communications, consumer, and computing applications. With a product portfolio 10 times greater than any other supplier, IDT is in a unique position to address the needs of virtually any application. With the industry’s largest market share, IDT is the only ‘one-stop-shop’ for timing solutions, offering products from full-featured system solutions to simple clock building-block devices. Factory-programmable options and clock solution customization capabilities address unique customer requirements, while the lowest jitter and lowest power features set IDT apart from the competition. Products are accompanied by a world-class support team driven by service and responsiveness. 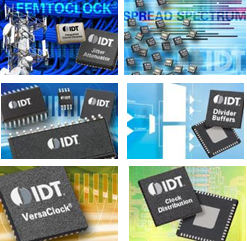 IDT’s industry-leading portfolio of timing devices includes RF and WAN PLLs, VCXO/VCSO, synthesizers, buffers, and Frequency translators.